I have a confession to make… Lately I have been really hard on myself. I have been up and down a lot and beating myself up about it because I feel like I should be further along in my emotional growth than to allow myself to keep riding this emotional roller coaster. The reality is, that’s probably true. I am far enough in my journey that I should definitely be more emotionally stable. And when I really stop and look at it, I have to admit that I am incredibly stronger than I used to be… It’s just that I’m not where I want to be. Yes, I have built my emotional muscles and developed the mental strength to withstand very challenging circumstances, but there are times when some things still get to me. Regardless of what I think I “should” be doing, that place right there in the middle that I just described is the perfect place to be. What I have learned the most on my journey to my best life is that everything happens for a reason. Obviously, I refuse to get off this emotional roller coaster because I have yet to master the principles that accompany the ride. The more you do something the better you get at it. Evidently, I will be an emotional master by the time I finally have enough of this ride. What I’ve also noticed is that in the midst of all my mess, I have been incredibly blessed. I keep getting the message that no matter the lessons I have yet to master, there is an infinite pool of love and acceptance that I constantly have access to when I let go of my personal judgmental attacks on myself. I’ve realized that I’m harder on myself than God is. He keeps showing me love, support and favor as I make one mistake after another. If even God, the creator of all, can love me through my learning and growth process enough to continue to gift me with miracles through it all, why in the world am I being so hard on myself? And so, this revelation has led me to believe that no matter how many times I go up and down on my little roller coaster, no matter how many mistakes I continue to make, no matter how hard I am on myself when I make those mistakes, no matter what…. I am still enough to be blessed, to be favored, to be loved, to be cared for, and to be supported by God. You see, the beauty in my journey is that I not only have the opportunity to become a master of my own struggles, but I get to share the very same lessons with you. And so I am here to tell you…. No matter what you did yesterday, how bad you think you are today for not being who you should be, or how bad you feel with the state of your life… Right now, where you are, YOU ARE ENOUGH. Everyday that you wake up, you are gifted with a new opportunity to start over. I know there has been a theme lately here on the blog of having gratefulness for everyday – it’s because it is so necessary to truly get a grasp on life. When you realize that God’s mercies are new every morning, you can begin to truly live in them and recognize that as the true essence of your relationship with God. It wasn’t until I read “The Shack” that I got a deeper understanding of God’s love and acceptance of us as human beings. There was a part in the book where the main character was expressing how he thought God was probably disappointed in him for the many mistakes he’d made in his life. God explained to him that he was never disappointed in him because he never expected him to be anything more than who he was. I found myself expressing the same worries as the character in that book. I wrote in my journal, “God, I’m sure you’re tired of me going up and down and constantly coming to you with all this mess.” It’s good to know that all God expects from us is to be ourselves, in all our greatness… and all our mess. “To err is human” – God knows this more than anyone else. He is not sitting on His high thrown judging every mistake we make. All He wants is the best for us. This includes us realizing and striving to live our greatest potential, while learning and growing in the process. That’s it. So if the learning process incorporates repeat mistakes and wrong doings, it’s expected because it goes with the territory. The most important part of the journey is just to stay aware of God’s presence that lives within us as we go through it all. He wouldn’t have chosen you to live with if you weren’t worth His time. And there isn’t one of us that he hasn’t chosen. 1. You are in this situation to learn a specific lesson. Appreciate where you are for the learning experience, and become acutely aware of the lesson so that you can master the principle at hand. 2. No matter what type of person you are, what type of mess you’ve made of your life, no matter how many times you make the same mistake, different mistakes, or just simply do the wrong things, YOU, with all your flaws and wrong doings…. 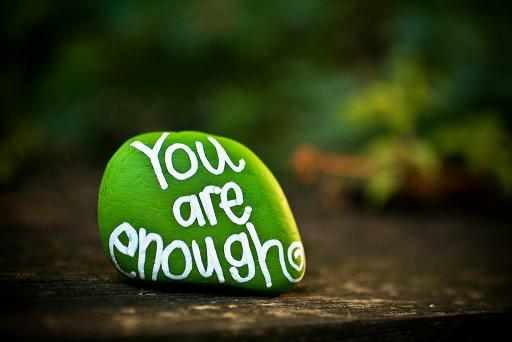 YOU, my dear, ARE ENOUGH…. You are enough just as you are for all the love, care, and support in the world to continue living the life that God intended for you. All you have to do is believe it. Share your thoughts in the comments: How have you noticed yourself feeling not enough in your life? What can you do today to eliminate that limiting belief? Being marginalized or feeling like I could do a better job does leave me feeling limited. The tools I use are the same ones I use to Get out of stuck. Acknowledge myself, accept myself and appreciate myself while I live every day according the the 5 agreements. Interesting topic and one that there is definitely a current need for. Thanks for sharing. I love that combination, “Acknowledge myself, accept myself, and appreciate myself.” That is a powerful formula for success. I guess that makes two of us on that roller coaster. Whenever I expect too much of myself, I end up giving little. Knowing that I’m enough gives me the confidence I need to carry on but making the same mistakes repeatedly isn’t ideal. The more I strive for that state of near-perfection, the closer I get and the happier I become because God loves growth. Thanks Alexis. Lanre recently posted..What Should I Do With This Baby? Lanre, the statement you made about “Whenever I expect too much of myself, I end up giving little” is so powerful. That is so true, because that thought process causes overwhelm. Anytime we begin to think that there is too much for us to handle, we end up doing nothing because we don’t believe that we can handle it and we feel like we don’t know what to do. So that makes that deep-seated feeling of “not enough” come up. It’s so important in those moments to remember that as long as we keep striving instead of giving in to overwhelm, we will continue to grow and eventually overcome all obstacles. Thanks for sharing. Your words are powerful for those who really stop to think about them. I do beleive in the quote that says “Life is a Journey and not a destination.” Our growth and progress never stops. Kids in some schools often get an “effort” grade. For me effort to do and be “good” renders the most satisfying feeling of peace even if the result sometimes falls short. Keyuri, that is so true. The effort we put forth is what is honored by the Universe, which is why we continue to get blessed by favor and miracles in even in the midst of our hardest times and worst mistakes. As long as we continue to put forth the effort to be, do and have better we will be rewarded. Thank you for your insights. Life is a journey with both its valleys and also its mountaintop experiences, and I think we learn from both but probably more from the valleys where we tend to move closer to God. Each new day is indeed a new “opportunity” and it’s always exciting to see what each new day will hold for us. Love your blog and, of course, I’ll be back! This is such an uplifting and encouraging post! Keep it coming! I love the transparency! We might not believe in the same God(s), but the lesson he/they provide is the same: You are enough. Thank you! And I totally agree. That’s why I stay out of religion and focus solely on Spirituality – to be sure the same message gets across. You are so on point! Mistakes are great if you can learn from them! I recall the saying that if you’re never making mistakes, you’re not trying hard enough. Thanks John. I love that saying. What a wonderfully motivating article Alexis. I agree that no matter how bad something may be at the moment, it’s important to count our blessings. No matter how dark it seems at the moment, it will pass. We need to keep our faith and look to a better future. Thanks for sharing with us. Wow, powerful message. I think we often forget that what is important is the journey not the end result. It’s easy to be harder on oneself than to say you are okay and you are loved. Firm believer that God is ever loving and supportive, and he sends us only what we can handle. Keep up what you are doing! Thank you Angela. You are so right. When we lose sight of the treasures in the journey, we forget the abundance of love and support that is always available to us. I have this same tendency to think I should be more than I am this moment. Now I have come to the place of remembering to stop and give thanks for NOW. For just being alive today, whole and strong. Just to be able to remember to do that, is a place on the journey.I don’t think we will ever be perfect, we have to accept that, keep growing and enjoy the moments. I guess that makes two of us on that roller coaster. Thank you for your insights. Whenever I expect too much of myself, I end up giving little. I have this same tendency to think I should be more than I am this moment. I know what you mean Suzanne. That’s why it’s important to remember your truth (you are enough in every moment). Thanks for sharing.